As every year on the evening of Good Friday, the liturgical commemoration of the Lord's Passion, the Church of God in Rome, guided by its Pastor, the Successor of Peter, participates in the devotional practice of the Way of the Cross at the Colosseum. Pilgrims from the worldwide household of God walk with the Christian community in Rome along the fourteen stations while millions of faithful of every language, people and culture take part in the prayers and meditations through radio and television broadcasts. A felicitous coincidence of calendars this year has the Christians of East and West celebrating simultaneously the great mystery of our one Lord's Passion, Death and Resurrection. All are therefore able to take part simultaneously in the commemoration of the founding event of their faith. This year the biblical texts for the Way of the Cross are taken from the Gospel of Luke and the meditation texts and prayers were composed by Abbot André Louf, a Cistercian monk of strict observance who is now living in a hermitage after exercising his ministry as Abbot in his community of Notre-Dame of Mont-des-Cats in France for thirty-five years, guiding it in the footsteps of Jesus Christ from the years of the Second Vatican Council to the threshold of the third millennium. He is a monk steeped in the Scriptures thanks to the daily practice of the lectio divina, an avid reader of the Church Fathers of the first centuries and of the Flemish mystics, a father of monks who is able to accompany his brothers in their spiritual life and in the daily quest for that "one heart and soul" that was characteristic of the apostolic community of Jerusalem. He is, then, a cenobite monk for whom solitude and communion are in constant existential converse: solitude before God and fraternal communion, inner unification and community unity, reducing all to the simplicity of what is essential and to the opening up to the varied expressions of a living faith. This is the daily undertaking of the monk, the dynamic of his stability in a specific community reality, the "work of obedience" (Rule of St. Benedict, prol. 2) by which a return is made to God. The texts of this Way of the Cross are filled with this liberating monastic labour, which is also the labour of every baptized member of the living community of the Church. Jesus is often found alone, sometimes by his free choice, other times because everyone has abandoned him: he is alone in the Mount of Olives, face to face with the Father; he is alone in facing the betrayal of one of his disciples and in the denial of another of their number; he faces the Sanhedrin alone, the judgment of Pilate, the scorn of the soldiers; alone he takes up the weight of the cross; alone he abandons himself totally to the arms of his Father. But Jesus' solitude is not fruitless, quite the contrary: since it arises from an intimate union with the Father and the Spirit, it in turn creates communion in those who enter into a living relationship with it. Thus in his Passion Jesus encounters the fraternal support of the Cyrenean; he recognizes the consolation of the women disciples who have come up to Jerusalem with him; he opens the doors of his Kingdom to the centurion and to the good thief, who are able to look beyond appearances; he sees the beginnings of the community taking place at the foot of the cross, being formed by his mother and the beloved disciple. Finally, the precise moment of what seems to be his greatest solitude, when he is laid in the tomb, when his body is swallowed by the earth, becomes the passage towards a renewed cosmic community: having descended to the underworld, Jesus meets all of humanity in Adam and Eve, announces salvation to "the spirits in prison" (1 Pet 3:19) and re-establishes the community of paradise. 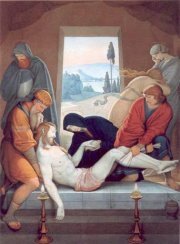 For every disciple of Jesus Christ, participating in the Way of the Cross means entering into the mystery of solitude and communion experienced by our Master and Lord, accepting the will of the Father for us all, until we are able to see, beyond the suffering and death, the life without end that bursts forth from the pierced side and the empty tomb. on the way that leads to Calvary. who sought to console him and to alleviate his pain. and whom he, in an abundance of love, forgave. that if possible [we] may attain the resurrection from the dead" (Phil 3:10-11). and his being placed in the tomb. who have loved us and given yourself up for us (Gal 2:20).